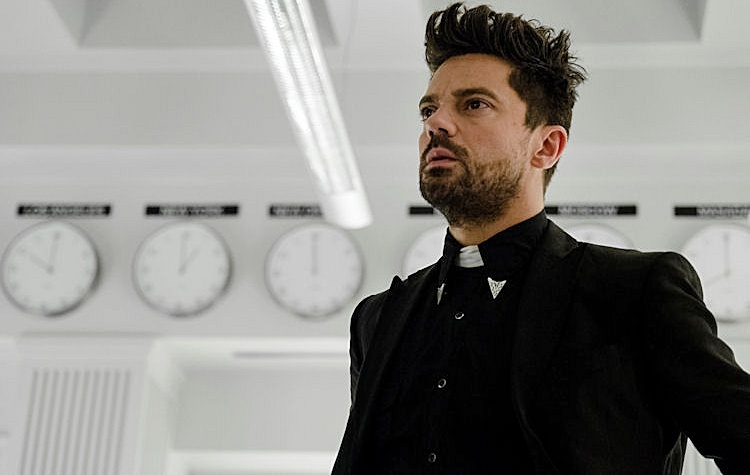 Seven episodes of setup have led Jesse Custer to a crossroads: He can continue to look for God or he can become God. It’s a twisty road to that point, courtesy of Herr Starr filling Jesse in on a slice of history kept hidden from the world. Before the crucifixion, Jesus had a fling and got a woman pregnant. When the baby was born, the apostle Thaddeus (aka St. Jude, the patron saint of lost causes) took the child and founded the Grail to protect the identity of the baby and its progeny until the time when Christ needs to return. As Jesse learns first hand after a strange trip with a pillowcase over his head, twenty-five generations of inbreeding have not been kind to latest scion of Christ, who – much to Starr’s dismay – is a wild-eyed simpleton named Humperdoo (who has drawings of himself with a large black and white dog). Upon their return to New Orleans, Starr makes the incredible offer to Jesse. Give up the search for God, and assume the place of the deity. 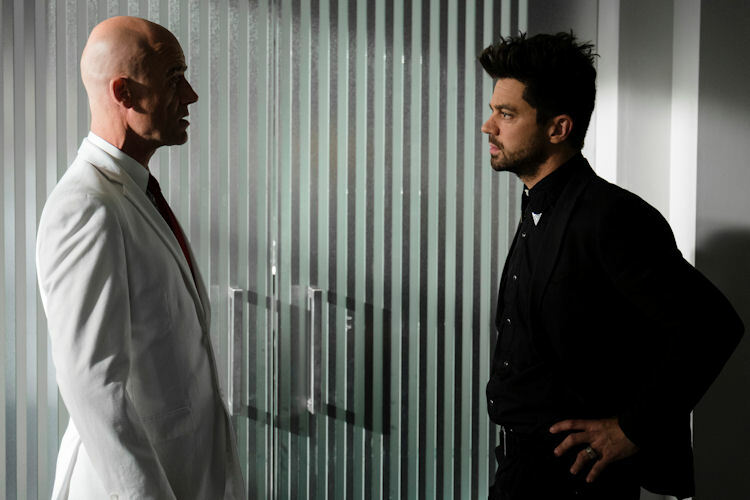 Obviously, Starr assumes he will hold sway over Jesse should they team up. Jesse is reluctant to take that drastic a step, despite Starr saying if that he were to continue the search, he would do so alone. Starr knows this because while he and Jesse were globe-hopping, Featherstone and company were back at the apartment trying to drive a wedge between Jesse and Tulip (and to a lesser degree Cassidy). Tulip is still struggling following her run-in with The Saint of Killers and Featherstone as the kindly neighbor Jen shows up after Tulip wakes up from a nightmare to discover Jesse gone and Cassidy treating Denis to some prostitutes. The two bond over chocolate chip pancakes and Guitar Hero. Featherstone nearly blows her cover when she mentions Dallas, and Tulip catches her in the lie. Thankfully, Featherstone’s partner Hoover steps up to play Jen’s abusive ex-boyfriend. Tulip and Jen get a few punches in and all is forgiven. Jen tells Tulip she should fix the loose tile in the bathroom and when she does so, Tulip discovers the Saint’s pistols and sabre hidden in the floorboards, which means Jesse is going to have a lot of explaining to do when he gets home. Cassidy had a relatively quiet episode. He’s still showing Denis the ropes of being a vampire, and not doing a great job of keeping his son from succumbing to his animalistic urges. This episode feels like the last bit of setup the show needs to do for the stretch run of the season (there are only three episodes left after this one), and the payoffs should start happening now that players are on the board and positioned for maximum drama.